My downstair neighbor John who happens also to take care of the building, came to show me a cookbook a friend of his offered him, and he wanted me to take a look at it, see if I knew the chef who was French (originally from Brittany) Josephine Araldo. She moved to San Francisco in 1924 and was famous long before Julia Childs was a household name. She owned a restaurant in San Francisco where she was also the chef until she died in 1989. So I looked through the book and I loved it, it’s called “From a Breton Garden“, and Josephine had a lot of recipes that are unknown and that you will not find in any other cookbooks. Some traditional and less traditional recipes from Brittany, many of them come from her grandma and are quite amazing. A lot of French cuisine cookbooks are the same with often the same traditional recipes, such as onion soup, boeuf bourguignon, sole meunière, etc…twisted around. I got a gift certificate for my birthday at Borders, and honestly I spent over an hour in the cookbook section and was unable to find something I really really liked. I have tons of cookbooks, I don’t care about traditional French, Italian or Asian cookbook, I am looking for something new and different, with beautiful pictures. If anyone has some suggestions, I will be happy to check them out. Well, I promised John I would make something from the book and share it with him…so after reading almost all the recipes, I realized I didn’t have all the ingredients I needed. But since I like to keep my promise, I needed to come up with something. I was thinking about those tartlets for a long time and decided to go ahead with them. I was a little disappointed and didn’t want John to be disappointed either that I didn’t make anything from Jospehine’s book. Next time. I made those tartlets for some of my parties and were always successful. They’re very easy to make, even the dough can be made in a blink of an eye. The crust has a nice golden color due to the wholewheat and almond meal, and the filling has no cream like regular tarts or quiches so it is quite light. I wanted to balance the fat content since roquefort and walnut are somehow fattening ingredients but there is just a little bit of cheese and nuts, so nothing to worry about too much. Other blue cheeses such as Stilton would work as well. In a mixing container, combine all the flours together and almond meal. Add olive oil, progressively and salt, then add enough water to make a nice smooth dough. You will see that if water is not enough, the dough will be crumbly. In a non stick pan, heat olive oil, then add onions, salt and pepper. Cook onions stirring in high heat to brown them, then decrease heat at low temperature, cover with a lid and let onions become soft, almost like an onion fondue. Add balsamic vinegar at the end and mix well. Roll the dough and place in tartlet molds (preferably non-stick molds). Place one layer of onions on top of dough. Add roquefort cheese on top, and walnuts. In a mixing bowl beat eggs with milk, parsley, salt and pepper. Pour on top of your tartlets. Cook in a pre-heated oven at 375 for about 20-3-minutes or until the crust is cooked and the top golden brown. Unmold and serve hot with an endive salad. This entry was posted by silvia on October 23, 2009 at 10:40 pm, and is filed under Appetizers, Vegetarian - dairy. Follow any responses to this post through RSS 2.0.You can leave a response or trackback from your own site. Oui au roquefort : yes to the roquefort !!!!! bravo for your tartelettes they look exquisite !! and a creme brulée with butternut squash c’est chez moi !! I just feeling like biting into one of those tarts now… you have all the lovely combination. Sigh – if only I could make pastry… The filling, no problem but I am very bad at pastry.. Sigh! Yum! Those look so so so so good. This is a lovely recipe! Do you use tartlet molds with a removable bottom? 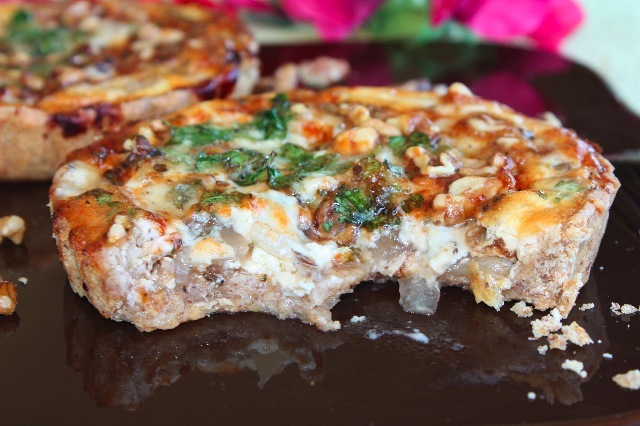 The roquefort and caramelized onion combination sounds so tasty. every recipe of you it’s so interesting,original and unique for me!very nice and tasty combination with roquefort! And I hope you’ll have fun cooking something from the cookbook soon! The crust sounds just as amazing as the filling! Lovely ingredient combinations for both. I feel like I can taste it looking at the picture! Well, as you know I am no longer afraid to make tart crusts, so I must try this!! Wow, another stunning food! I wish I’m your neighbour..ha ha!Love it! I love blue cheese and roquefort is one of them. In my family, it’s only me and my dad who loves them. 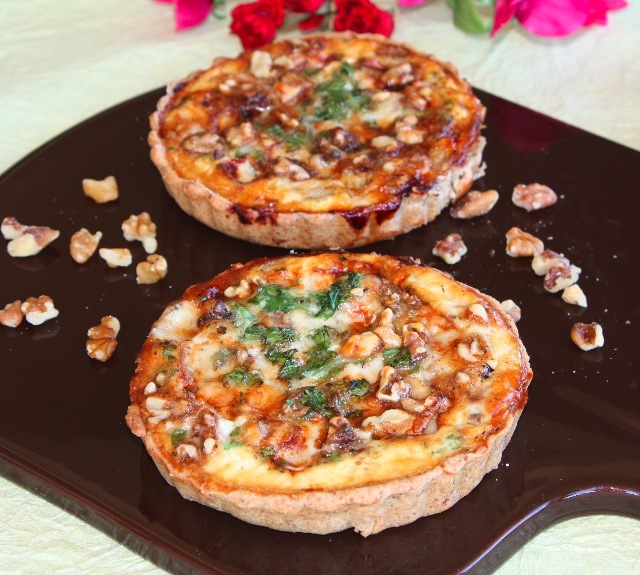 Love the tartlets too with the walnuts.